An approximate formula describing the time evolution of the state of two level atom and large number of counterpropagating photons interacting with it is obtained. This formula is a natural generalization of the diffraction scattering amplitude formula in the resonant Kapitsa-Dirac effect in the Raman-Nath approximation. The applicability of derived formula assumes more than n1,2 ≈ 20 photons in each of the counterpropagating beams. Russian Text © G.A. Muradyan, L.R. Arzumanyan, A.Zh. 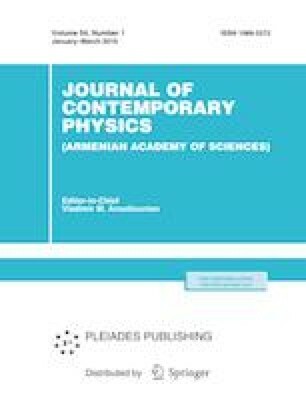 Muradyan, 2019, published in Izvestiya Natsional'noi Akademii Nauk Armenii, Fizika, 2019, Vol. 54, No. 1, pp. 16–23.